The Dry Tortugas is group of about eleven islands and islets that are in a circular shape, creating what in geography is called an atoll. An atoll is a group of islands that are in the shape of a circle, creating a natural harbor in the center. Another definition of an atoll is a single coral reef island that circles a lagoon. Atolls are known for their beautiful natural setting, with shallow waters and a diverse plant and animal wildlife. Typically, atolls are made from volcanic action. As a volcanic island begins to sink and subside, a fringe coral reef begins to grow in its surrounding area. As the volcanic land mass sinks more, the coral reef begins to surface, first creating a barrier reef island. The inner part of the barrier reef (what used to be the island mass) becomes a lagoon since conditions are not favorable for the reef to spread into that area. Eventually, the barrier reef remains above the surface, while the volcanic island is completely submerged. At this point, the area is considered an atoll. The Dry Tortugas are not actually considered an atoll, but their structure and position are very similar to an atoll. The only atoll in the area is the Marquesas Islands. These were thought to be created by a meteor, and not by volcanic eruption. 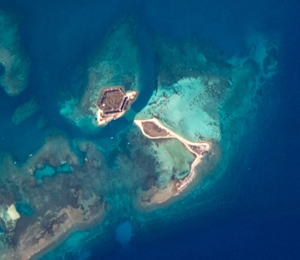 The Dry Tortugas are similar to an atoll in that they are part of a coral reef formation. They also contain all the natural beauty of an atoll, with the coral reef just meters from the shores of the main isles of the Tortugas and the shallow waters allowing for easy access from island to island.